For upcoming courses please click here. Course Overview click here to download the application form. This comprehensive course fully approved and accredited by the Health and Safety Executive aims to equip delegates with the essential knowledge and practical experience to enable them to carry out first aid in the workplace. Delegates will learn vital skills by participating in unique practical exercises and scenarios devised by Survival-linX Solutions. 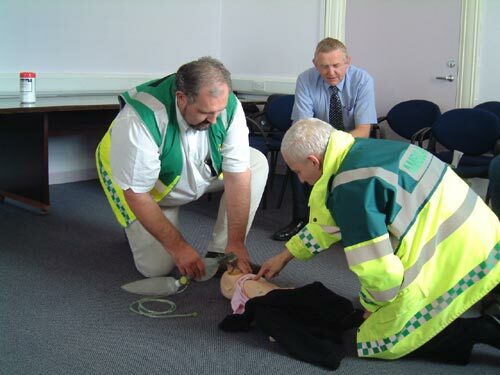 Any person no matter what their level of knowledge who wishes to become a qualified first aider for the workplace. Also great for those who want a comprehensive knowledge of first aid. 09:10 am � 4:30pm (approx) This course can be run in-house for up to 12 delegates or individuals can attend our open courses. Full attendance is mandatory to achieve HSE (NI) approved FAW certification. Enrolment for the 4 day FAW course can be made by contacting our course organiser by email, telephone or by printing off and completing the FAW application form. Booking will be confirmed by letter.